"It's time to repeal the Death Tax!" The Founders of our country believed this so strongly that they included a clause in the U.S. Constitution that forbids seizing an estate at death as a punishment for treason; it is unconscionable that the government now seizes up to 40 percent of everything a person leaves to his or her children as a punishment for achieving the American Dream. 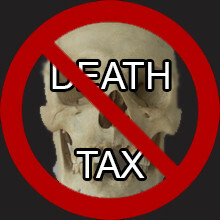 TELL CONGRESS TO REPEAL THE DEATH TAX AT ONCE!